Notwithstanding the absence of the red carpet, the star-studded District 18 Democratic candidate forum on Sunday evening was for politicos what the Oscars are for Hollywood. If only Joan Rivers, God rest her soul, was tasked to give commentary. If only. 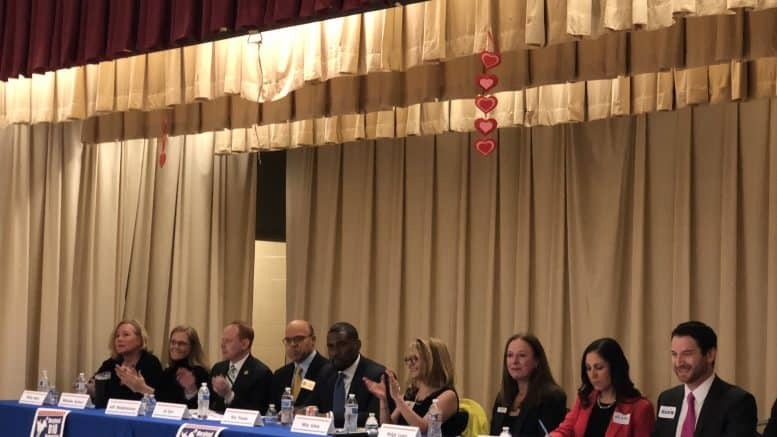 11 Democrats running for state office in District 18 – three Senate and eight House candidates – filled the stage at the Holiday Park Senior Center in Silver Spring for a candidate forum that was co-sponsored by numerous Montgomery County Democratic groups. Moderated by Charles Duffy, whose discursive and somewhat verbose editorializing nearly caused an all-out audience revolt three-quarters of the way through the forum, the 11 Democrats from the kickoff were challenged to audibly demonstrate their dissimilar policy agendas. The exercise proved somewhat successful. Mila Johns, Dana Beyer, Ron Franks and Leslie Milano agreed with one another that Montgomery County should end its liquor monopoly and exit stage left, while Jared Solomon, a strong ally and supporter of labor, argued the position of the county retaining its control over our Bourbon and Vodka. His position is slightly more nuanced. The candidates diverged on other policy issues, of course – e.g., armed security guards in schools and the process of attracting Amazon (Emily Shetty advocated for greater transparency). While all candidates stood their ground and drew attention to their discerning candidate platforms and respective experience, a few candidates truly distinguished themselves from the herd. It has become abundantly clear that Leslie Milano has a robust and comprehensive command of the issues. A pragmatic progressive, or so it seems, Milano’s bedrock platform includes bringing jobs to the district coupled with several policy goals for securing further economic development – and she’s willing to find solutions across the proverbial political aisle. Her background in business certainly lends to her credible economic plan. Mila Johns and Jared Solomon equally impressed. Johns for her candor and advocacy for Death with Dignity and legalizing marijuana and Solomon for his vast policy knowledge on education and senior health issues. On another front, Johns freely admitted that her position on dissolving the county’s Department of Liquor Control may upset her friends at the SEIU, who, incidentally, just endorsed her candidacy. Her raw transparency was nonetheless refreshing to see in real-time. Amid the candidate field, Emily Shetty is hands-down an uncompromising healthcare policy expert. Her ability to get wonky on issues mirrors that of state Sen. Rich Madaleno’s talents. Helga Luest’s sincere passion as an advocate for victims of abuse and violence was on clear display last evening. Her confidence at the mic was equally inspiring. It is clear and convincing that Dana Beyer is consistently the most articulate and prepared candidate on any stage. Bar none. It should not go unnoticed that she used her closing remarks to emphasize that voters are looking for candidates with integrity and character. Also check out Seventh State Blog’s take on the forum. A Miner Detail captured video.